We went to Brunchinos Belmont on a recommendation that their French toast has to be tried. And of course we absolutely had to go after that. Its location seemed quite out of place for a breakfast cafe. 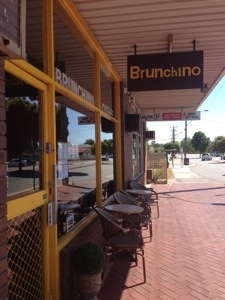 Brunchinos is in the more semi industrial area of Belmont and is surrounded by slightly run down, older buildings. Nevertheless we headed on inside. When we entered the cafe the staff were incredibly friendly and welcoming. It was obvious that it was a fairly new venture, and the staff were sincere and eager to please. With the exception of a little mix up over our coffee the service couldn’t be faulted. 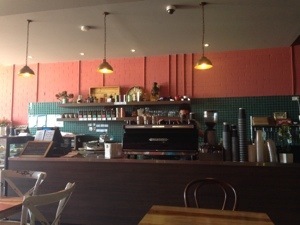 The inside of the cafe was nicely furnished with a vintage feel, well suited to the breakfast crowd. We ordered flavoured coffee because we weren’t sure what to expect. 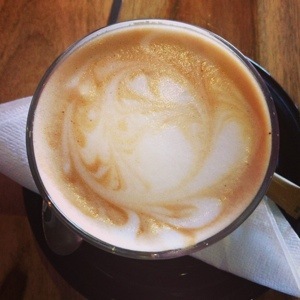 However it was surprisingly good, the flavour of the vanilla was really nice, there was no bitterness from the coffee and it wasn’t overwhelmingly sweet. 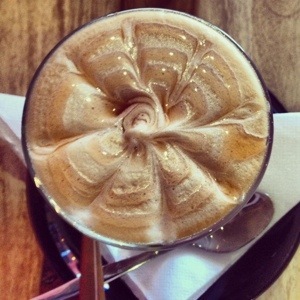 The caramel latte looked really beautiful, the flavour was good but not quite as nice as the vanilla. We would have been very happy with our usual coffee order, and as we are quite picky this was very impressive for such a new cafe. 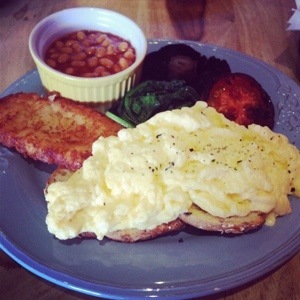 Brunchinos has a breakfast, all day brunch and lunch menu, we selected the French toast and the vegetarian breakfast. Both were incredibly cheap and came with large servings. 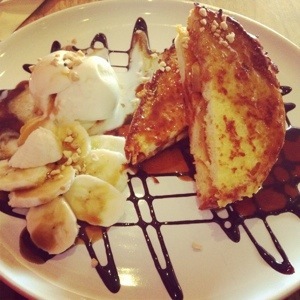 The french toast was only $13, and consisted of stuffed french toast, with oven baked cinnamon apple, banana, vanilla ice cream, butterscotch and then drizzled with chocolate sauce. There was quite a large number of flavours, and while they all tasted good and did work well together, the dish would have greatly benefited from more coherence of flavour and direction in what the dish was actually trying to do. Frankly it was so cheap I really didn’t mind and it was a sweet tooths delight. The french toast was great, crisp on the outside and light and fluffy in the middle. The apple inside was soft and delicious, but I would have liked more of it. I loved the addition of the butterscotch and the vanilla ice cream as it melted, mixing with the chocolate sauce creating a lovely mess to dip my toast into. I’m not sure what to make of the banana, but the dish as a whole was very well presented. The vegetarian breakfast was nothing particularly special, a good size and an even better price at $15.45 (don’t think I’ve seen anything at 45c but an extra 5c in my pocket isn’t anything to complain about). Brunchinos has a chance to make something really special with what they have if they refine their focus a little. Ultimately we could pay more money and go somewhere a little more interesting but if you want good value and are in the area its a good place to check out, plus if you’re a french toast fanatic theirs is definitely worth a try. Its the first place we’ve seen that has a stuffed french toast option so if you’re curious give it a go!